I'm trying to solve aerodynamics of whole aircraft by vortex lattice method (or deeper here). The problem is that sometimes trailing vortex filaments from Horse Shoe Vortexes of main wing hits panels of rudder/elevator which leads to singularities (infinite coupling between the two panels). Is there good way to damp those singularities? I was thinking something like adding imaginary part to expression for vortex filaments might help, but than vorticity is not exactly conserved. This is related to my previous question which was prehaps a bit long, unclear and unfocused. Browse other questions tagged fluid-dynamics vorticity or ask your own question. 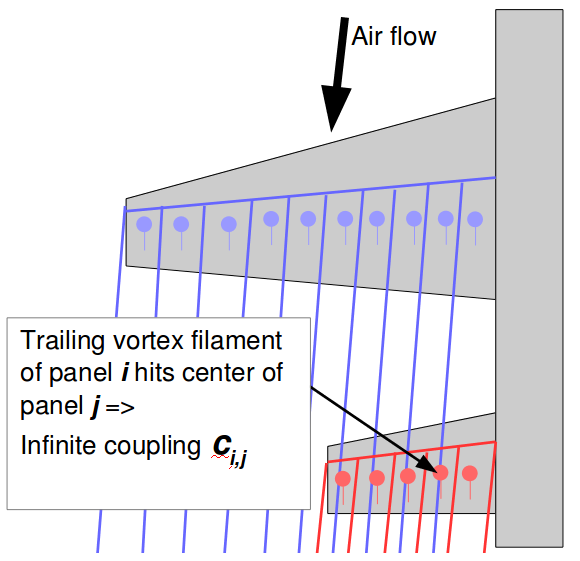 Vortex Lattice Method: better basis than horse-shoe vortex? How to choose the relaxation time in the Lattice Boltzmann Method?